I have to admit, I've always been a bit put off by pierogies. The idea of pasta stuffed with potatoes? Sounds too starchy for me. That is, until I had Mike's mom, Nadine's, pierogies. Mike's mom is Russian and every year we celebrate Russian Christmas with a feast of a variety of pierogies and beef stroganoff. 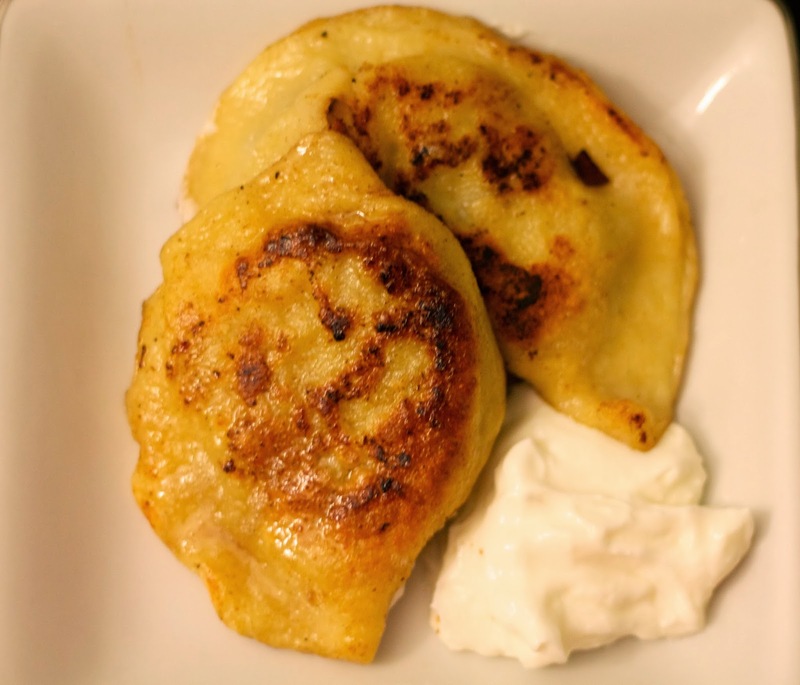 Turns out, you can stuff pierogies with whatever your heart desires! My favorite are Nadine's sauerkraut and mushroom and onion, so I thought i'd give the latter a try. Pierogies are great for a party because you can make them a few days in advance. After you boil them, just cool them, refrigerate, then fry them up when you're ready to serve. To prepare the dough, whisk together eggs and sour cream. In a separate bowl, combine flour and salt. Add the sour cream mixture to the dry ingredients and stir until just combined (if the dough isn't coming together, add a bit more sour cream, one tablespoon at a time). Form the dough into a ball, wrap in plastic wrap and chill for 30 minutes to an hour. Meanwhile, prepare the filling. Heat a sauce pan over medium heat and add 1 tbsp. olive oil. Add the onions and sauté until soft, about 10 minutes. Add the mushrooms and sauté until soft, 2-3 more minutes (if the pan looks dry, add the second tablespoon of olive oil). Divide the dough in half and return half to the refrigerator. Lightly flour your surface and roll out the dough to roughly 1/8 in. thickness. Use a 4 inch round biscuit cutter to cut the circles. Fill each circle with 1 tbsp. of the mushroom mixture (careful not to overstuff or they may burst open) and carefully fold the circles, pinching the edges to seal. Repeat with the second half dough. Bring a large pot of water to a boil and boil the pierogies in two batches. Boil for 2-3 minutes, or until the pierogies float (stop after this point if making in advance). After the pierogies are boiled, heat a sauté pan to medium heat and add 1 tbsp. butter. Fry the pierogies for 2 minutes per side, or until golden brown. Serve with sour cream and ketchup. Enjoy!